Indiana’s Big Ten season will be one that goes down in the record books. The Hoosiers finished with a conference record of 8-0-0, with three additional wins in the Big Ten Tournament. It’s the first time a Big Ten team has recorded an unbeaten league season since 2005. Yeagley’s team has not confronted that losing feeling when it comes to regular season play in quite some time. Not only did the Hoosiers go unbeaten this season, but they haven’t lost a Big Ten regular season match since Oct. 10, 2015. Players reflecting on the team’s accomplishments pointed to something else as to what they’ll remember most about this season. Gutjahr, along with seven other seniors completing their IU soccer career at the end of this season, have plenty of accomplishments to remember during their careers. The group combined for a 60-10-17 record over the last four seasons, which means this group won or drew 89 percent of its games during a four-year span. To put that in context, in the four years that preceded this senior class, the Hoosiers won 54 percent of games, and won or drew in 72 percent of games. This senior class (2015-2018) had 18 fewer losses compared to the previous four years (2011-2014) and six more victories. Yeagley said that the current group of Hoosiers possesses incredible soccer talent and is armed with a resilience that helps them compete in each and every game. Additionally, Yeagley added that this group of seniors is setting the bar higher for what has already become a storied program and will challenge future classes. As for the regular season, Indiana balanced Big Ten dominance with national matches against ranked teams that could challenge them for an NCAA championship. Indiana lost its first match to Wake Forest, now the number one team in the country. The match ended with Wake Forest’s golden goal in double overtime. 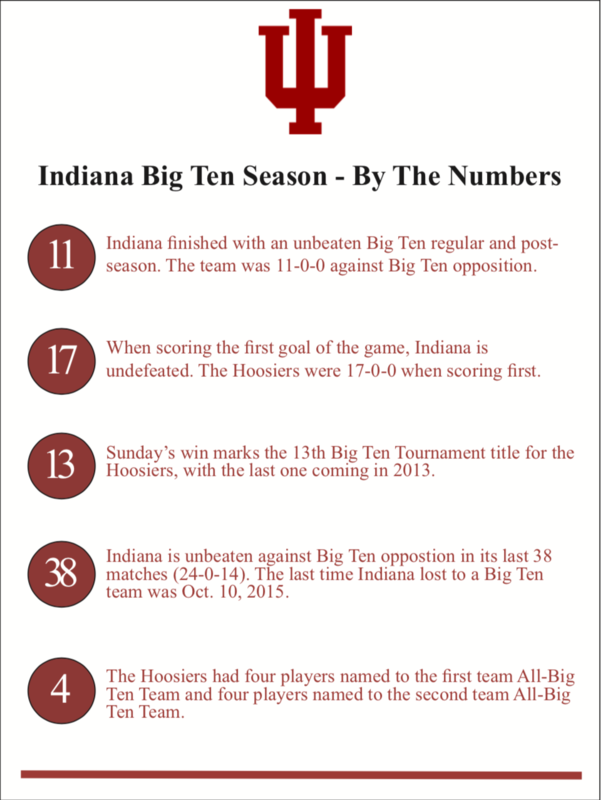 But following that loss, Indiana reeled off nine straight wins, four of which came against ranked opponents. The Hoosiers would go on to finish with a 6-2-0 record against ranked teams during the season, while posting an undefeated record against unranked teams. Arguably the most important game for the Hoosiers came on Sept. 11 against then-8th ranked Notre Dame. That was the only match this season where Indiana’s opponent grabbed the first goal and the Hoosiers came back to win the match. Indiana lost the other two games where opponents, Wake Forest and Kentucky, scored first. On the flip side, perhaps the most impressive aspect of Indiana’s season, the Hoosiers never lost a game where they scored first. Including its Big Ten Tournament Final win against Michigan, the Hoosiers finished the season with a 16-0-1 record in games where they scored first, with the one draw coming in the Big Ten Tournament semifinals match against Maryland, where Indiana advanced on penalty kicks. Yeagley said what makes this team so dangerous is that it is not one dimensional and can outplay strong opposition with different approaches. Yeagley is certainly correct in that regard. Indiana has found a multitude of ways to win this season and whether it be its offensive prowess or stout defensive presence, Indiana’s statistics back up Yeagley’s belief. For instance, Indiana is 10-1-0 in games this season decided by one goal, with three of those wins coming in the overtime period. Additionally, Indiana played only one match this season where it scored no goals and managed to tally three or more goals in five games, or 25 percent of its games. Having completed its first two goals of the season, Indiana now turns its attention to the final goal– winning a NCAA title. A win for the Hoosiers would be the program’s ninth NCAA championship and the first since 2012. But while coaches and players agree that a national championship is the ultimate trophy, there’s disagreement as to whether failure would constitute an unsuccessful season. “This is not a get to Santa Barbara or bust mentality,” Yeagley said on one side of the argument. But players desperately want to get that national championship that has evaded them for six years. Cory Thomas, a senior midfielder and goal scorer in the Big Ten championship game, said a national championship is critical for this team. Indiana is already on its way to completing that goal as the No. 2 seed has won its first two NCAA tournament matches against the University of Connecticut and the Air Force Academy. The Hoosiers’ next match will be Friday, November 30, in Bloomington against the No. 13 Notre Dame Fighting Irish. The two teams previously met in the regular season, with Indiana escaping with a 2-1 win in overtime.